I can't believe it's Wednesday already. My younger daughter, Sharron is back from Chile (16 months is way too long for a mummy) and we've been doing so much hugging and yacking that I forgot all about posting this week! Trust me, we have been eating, just not taking the time to write about it. Naturally there were certain cravings to deal with....like bagels , fresh rye bread, challah. You'll notice much of what she's been missing most is the serious carb category - BREAD! And frankly, her choice has been to eat it plain (or toasted) with slathered with butter or cream cheese. Dinners have been some of her long time favorites - Teriyaki Flank Steak and we did have a pasta - an old standby - Penne with Shrimp and Garlic Breadcrumbs. (I was on autopilot, since not only was Shar back and the time just flew by, but none of us were feeling well - colds, sore throats...naturally we did have lots of mugs of chicken soup. Unfortunately, I didn't have the energy to make matzo balls and it was too cold to venture out to buy some dumplings or kreplach, but the broth was very soothing). 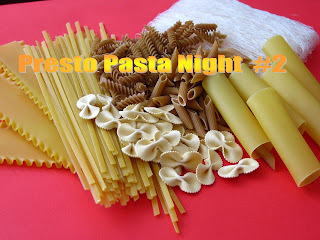 Tonight we are having a new pasta dish and I will be taking pictures so that I can be ready for Presto Pasta Night #2 this coming Friday. I'd love to have you join the party, so check out here for the details. Last week we had 8 fabulous recipes, so diverse, so much variety, I can't wait to see what you all come up with this week. I've already received two terrific ones. As for me....I'll give you a hint...mushrooms. I'm looking forwards to your round-up!